Last time, we reviewed some foods that can cause problems with braces. Hard, sticky and chewy foods break and pull brackets and wires out of place, which will cause some discomfort from poking wires, loose ligatures, and loose brackets. This time, you will see some of the problems that could happen with braces - and what our patients do to make themselves comfortable. Patients take care of most braces problems on their own. Only the most severe emergencies require immediate attention by an orthodontist. 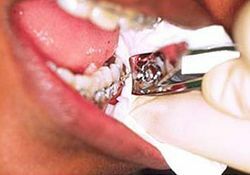 The following orthodontic problems and their treatments are listed in the order of the least severe to the most severe. Food caught around braces is not an emergency, but can be a little uncomfortable or embarrassing for the braces wearing patient. It is easily fixed with a piece of dental floss. Try tying a small knot in the middle of the floss to help remove the food, or use an interproximal brush or toothpick to dislodge food caught between teeth and braces. Tiny rubber bands or small, fine wires, known as ligatures or ties, hold the wire to the bracket. If a rubber band should come off, you may be able to put it back in place using sterile tweezers. If a wire ligature comes loose, simply remove it with sterile tweezers. If the wire tie is sticking out into the lip but is not loose, it may be bent back down with a Q-tip or pencil eraser to eliminate the irritation. Of course, when one ligature pops off or breaks, others may follow. Be sure to examine all ligatures. 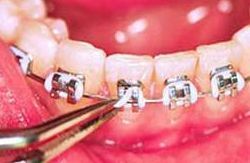 Missing or broken ligatures should be brought to the attention of the patient’s parent/guardian, who should then inform the orthodontist. There is no need to call or visit the office. At your next scheduled appointment a new rubber band will be placed (you can even pick a new color!). In a situation where the wire is extremely bothersome, and the patient will not be able to see the orthodontist anytime soon, you may, as a last resort, clip the wire. Reduce the possibility of the patient swallowing the snipped piece of wire by using folded tissue or gauze around the area. Use a pair of sharp clippers and snip off the protruding wire. Relief wax may still be necessary to provide comfort to the irritated area. If the braces have come loose in any way, the parent/guardian needs to be notified and they should call the orthodontist to determine appropriate next steps. Brackets are the parts of braces attached to teeth with a special adhesive. They are positioned in the center of each tooth. The bracket can snap off if the patient eats one of those hard or crunchy foods orthodontic patients are instructed to avoid, or if the mouth is struck while at play. If the bracket is off center, the adhesive may have failed. Call the parent/guardian, and recommend that they immediately notify the orthodontist, who will determine the course of action. If the loose bracket has rotated on the wire and is sticking out and the patient cannot immediately be taken to the orthodontist, you can do a temporary fix to alleviate discomfort and prevent further damage. But take care to prevent swallowing or other injuries. To put the bracket back in place, use sterile tweezers to slide the bracket along the wire until it is between two teeth. Rotate the bracket back to the proper position, then slide it back to the center of the tooth. Patients rarely swallow braces (fortunately!). But when it does happen, it can be fairly alarming to the patient. Encourage your patient to remain calm. If the patient is coughing excessively or having difficulty breathing, the piece could have been aspirated. If you see the piece, you may carefully attempt to remove it. But do not make the attempt if you could cause harm. If appropriate under the circumstances, examine the patient’s braces for problems that may result from the missing piece, such as looseness or irritation, and treat as specified above. If you are unable to see the piece and believe it may be have been aspirated, notify the parent/guardian and the orthodontist immediately. 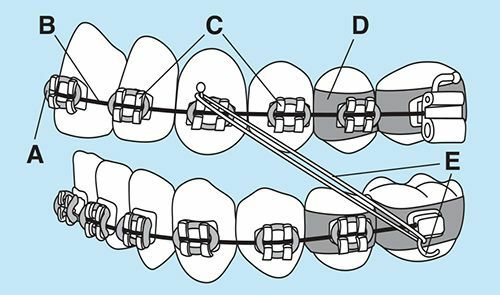 The archwire is tied to all of the brackets and creates a force to move teeth into proper alignment. 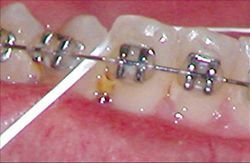 Brackets are connected to the bands, or directly bonded to the teeth, and hold the archwire in place. 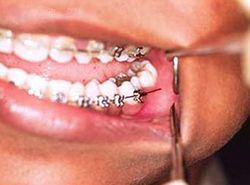 Hooks on braces are used for the attachment of rubber bands, which help move teeth toward their final position. Next up, what to do about more serious emergencies.